How to install the Larson Fan? Why is my ventilation fan so noisy? 1. Most of the noise is generated by the housing. Check the flanges of the divider piece (the big removable piece in the center dividing the housing into an upper and lower section) to see if they are tight to the outside walls. Remove and bend loose fitting flanges outward if needed. 2. If the housing was mounted to the joist with only nails, the nails will probably loosen up over time. Causing the whole housing to vibrate loudly. Replace nails with screws if possible. 3. Clean the fan or blower wheel. Dust will build up on the blades and may cause an unbalanced situation, causing more vibration and noise. 4. The bearing of the motor may be worned from years (decades) of use. Everything wears out eventually. 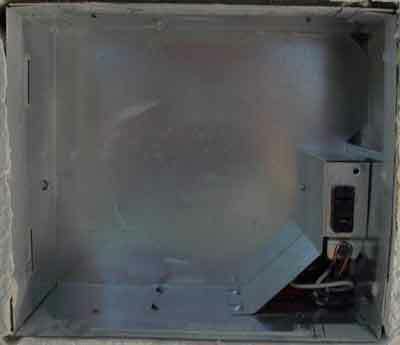 Disconnect the electrical power supply and lock or tag the service panel for the existing ventilation fan. Remove the grille from the existing ventilation fan. Pull grille down to expose the two springs. Squeeze each spring together and pull down again to release the springs through the slots in the divider plate. Remove motor, divider plate and blower wheel assembly from the fan housing. Unplug motor cord from receptacle. Find the single tab on the divider plate (located next to the receptacle). Hold up the divider plate while pushing out on the side of the housing. If necessary, insert a straight screwdriver between the divider plate and side of housing and gently pry housing away from the divider plate. Pivot the divider plate down and out. Check existing housing. Vacuum the interior of the existing fan housing with a dusting brush attachment. Examine the housing to make sure it is securely fastened to the building structure and free of any holes caused by corrosion or other means. The receptacle must be intact. If any damage is found, have a qualified person(s) do any needed repairs. 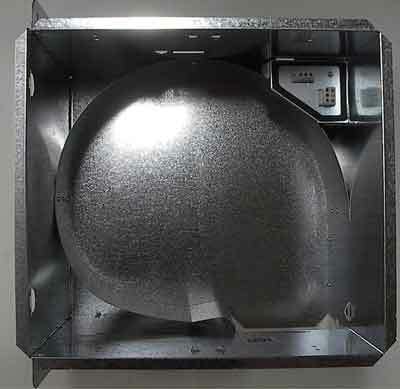 Install new ventilation fan/damper assembly into existing fan housing. Insert the two divider plate tabs into the slots in the housing and pivot the fan/damper assembly up until the tab near the receptacle snaps into the opening in the fan housing. Plug in motor. Install grille. Squeeze one grille spring together and insert it into the slot in the divider plate. Repeat above with the other grille spring on the other side of the divider plate. Push grille upward until it is tight against the ceiling. 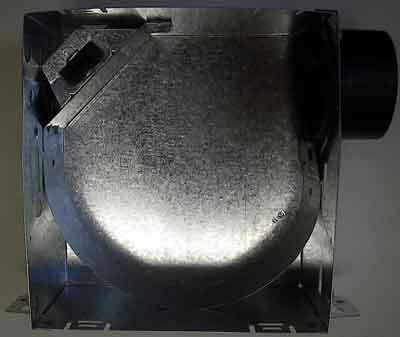 Restore electrical power to the ventilation fan/damper. 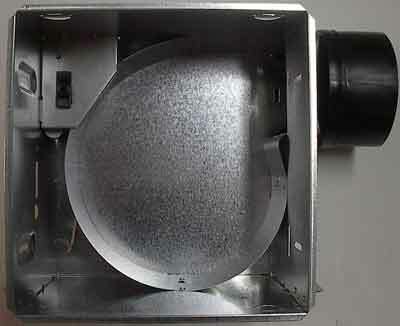 Remove motor, divider plate and blower wheel assembly from the fan housing. Unplug motor cord from receptacle. With one hand under the motor, remove screw by the receptacle. If necessary, insert a straight screwdriver between the divider plate and side of housing and gently pry housing away from the divider plate. Pivot the divider plate down and out. 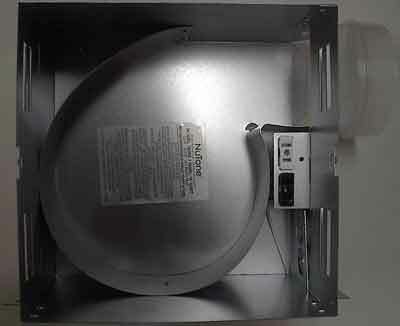 Install new ventilation fan/damper assembly into existing fan housing. Line up the opening in the plate with the outlet in the housing. Insert the two divider plate tabs into the slots in the housing and pivot the fan/damper assembly up until it is touching the wiring box. Secure in place with existing screw. Plug in motor.